Metropolitan Cleopas of Sweden and All Scandinavia was elected CEC vice-president at the 2018 Novi Sad General Assembly. 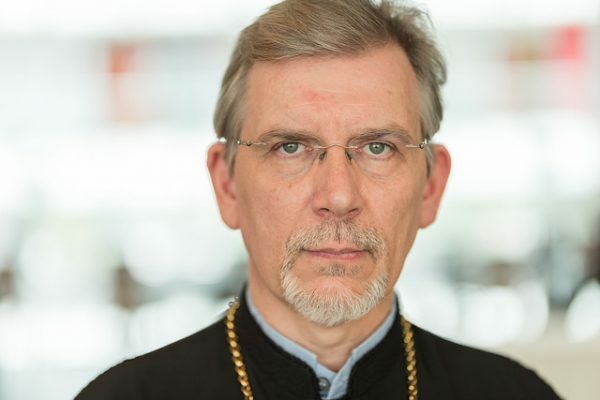 Originally from Greece, he was elected Metropolitan of Sweden and All Scandinavia and ordained into the episcopacy in 2014 by His All Holiness Ecumenical Patriarch Bartholomew. Among his many associations, he served as member of the Holy and Sacred Synod of the Ecumenical Patriarchate (March 2015 to February 2016). He studied Theology at the Universities of Athens, Thessaloniki, Durham, England, the Holy Cross Greek Orthodox School of Theology in Brookline, Massachusetts, Harvard Divinity School, and Boston University. He was ordained a deacon and presbyter by Metropolitan Cleopas of Thessaliotis. He also served as a clergyman in the Holy Metropolis of Thessaliotis, the Holy Archdioceses of Thyateira and America, as well as a university professor at the Holy Cross Greek Orthodox School of Theology in Brookline, Queens College, and the University of Massachusetts. Metropolitan Cleopas has authored a number of publications on theological and academic themes in Greek and English. He was honoured by the Academy of Athens in 2009 for his book Saint Nectarios of Pentapolis and the Rizareios Seminary (1894-1908).